The 3-In-One Labor Poster is a general labor law poster poster by the Nebraska Department Of Labor. This is a mandatory posting for all employers in Nebraska, and businesses who fail to comply may be subject to fines or sanctions. 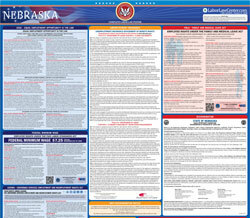 This poster contains all of the required Nebraska labor law postings, and can be used instead of individual posters. It appears you don't have a PDF plugin for this browser. Please see the link below to download nebraska-state-3-in-1-english.pdf. returned, regardless of cause. D.
though beneﬁ ts are not payable for that week. 008. Weeks of disqualiﬁ cation assessed pursuant to Neb. Rev. Stat. §48-628 and reductions in beneﬁ ts determined pursuant to Neb. each person compensated by way of gratuities shall equal or exceed nine per hour. wages at a rate of at least seventy-ﬁ ve percent of the minimum wage rate. terms and conditions described in Neb. Rev. Stat. §48-1203.01. remunerations in any medium other than cash. This poster is designed to fulfill three state workplace posting requirements. It does not necessarily fulfill ALL workplace posting requirements. Check dol.nebraska.gov/LaborStandards/RequiredPosters periodically for poster updates.